My creativity, I am in a group called All Things Tim where we do alot of stuff Tim Holtz and if your a scrapbooker or paper designer you know who Tim Holtz is he is an awesome creator of many things to do with paper art. Well we are doing a swap called Creative Chaos where we make 12 Halloween tags which are then developed into a canvas of 12 different size tags that they create a cool wall hanging. 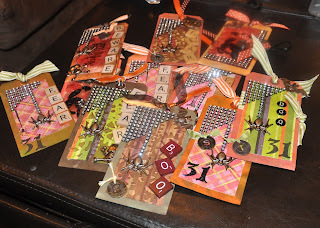 I finished my 12 tags this week and are getting ready to mail them I thought I would share them. I cant wait to see the finished project. Love the spider and web! Can't wait to see them in person.